Have you ever wondered how much the level of the stock market can vary over one week? What about two weeks or a month? Until recently, I had not thought much about the range of short term market fluctuations. After all, I consider myself a long-term investor! However, a recent experience piqued my curiosity, and I decided to do a little research. About a month ago, I transferred a small retirement account from a former employer into another existing retirement account. I wasn’t able to do an electronic transaction or a “transfer in-kind“, so I had to liquidate the old account before sending the funds to the new account provider. The provider of the old account issued a paper check, and there was a surprisingly long delay for mailing and processing before the funds showed up in the new account. The experience got me thinking about the risk of being out of the market (in cash) for short periods of time while transferring funds between accounts. The market may fall (good!) or rise (bad!) by a meaningful amount in a fairly short time. If the amount being transferred is large, the risk can be significant. 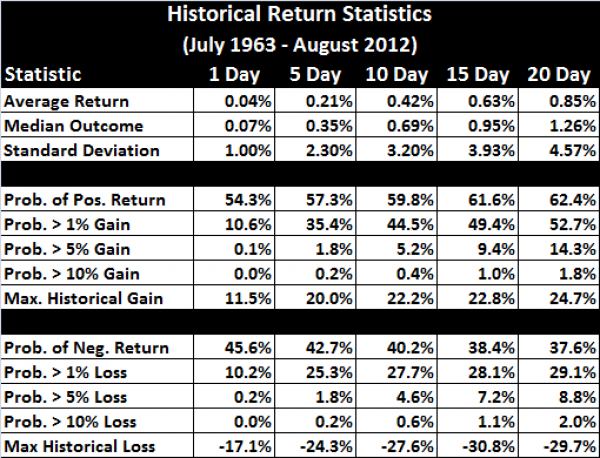 In this post, I’ll look at some historical statistics on short term market returns. I downloaded daily return data from July 1963 – August 2012 from the Ken French website. The returns are available in the Fama/French Factors [Daily] file. The daily risk-free rate needs to be added back into the RMRF column to get the total returns. Note that these are “total stock market” returns, so the results may differ slightly from a similar analysis using S&P500 returns. I calculated compound returns over rolling periods of 5, 10, 15, and 20 trading days. I did not restrict the analysis to calendar week boundaries. I then calculated a number of statistics on the 1, 5, 10, 15, and 20 day returns. Note that the short-term return distributions are very “fat-tailed”, so I didn’t do any statistics which assume normal distribution. Instead, I calculated the historical frequency of returns which exceed the various cutoffs. The market can be extremely volatile over short time periods! This creates a big risk if you must be out of the market for a couple weeks while transferring money between accounts. For example, assume you transfer $100,000 and the transfer takes 10 days to complete. You are out of the market for the full 10 days. Historically, investors have, on average, missed out of $420 of gains over a 10 day period ($100,000 x 0.42%). The median outcome is that you will miss out of $690 of gains ($100,000 x 0.69%). Of course, there has also been a 4.6% possibility that the market will fall by 5% or more, and you will end up more than $5000 ahead! My takeaway from this analysis is that transfers of funds which cannot be done electronically or in-kind should be planned carefully and monitored closely to ensure minimal delay.